Beans are a highly versatile, inexpensive, easy-to-grow food that have been a mainstay in the diets of people around the world for centuries. The mighty bean is low in fat and is packed with nutrients, protein, fiber and antioxidants. According to the US Dry Bean Council, eating beans may reduce your risk of developing heart disease and certain cancers. Adding more beans to your diet may also help maintain proper blood sugar levels, reduce the risk of birth defects and aid in weight management. Bush beans and pole beans are green in color and are more commonly known as green beans. Blue Lake and Derby are two types of bush beans. Kentucky Blue and Kentucky wonder are varieties of pole beans. 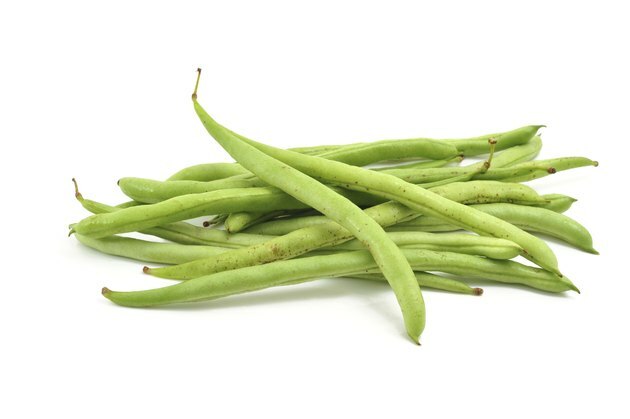 A 1/2-cup serving of green beans contains about 15 calories and 1 gram of protein as well as 7.5 milligrams of vitamin C. Young green beans are delicious when served raw in salads. Steam green beans whole to preserve their color and nutritional value. The pinto bean is a dried bean that is related to the red kidney bean. 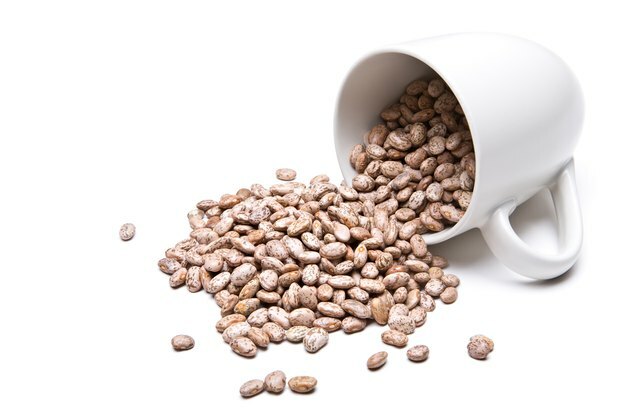 Pinto beans contain niacin, thiamine and folate and have 7.4 grams of fiber and 7 grams of protein in a 1/2-cup serving. That same serving of cooked pinto beans has approximately 118 calories. Refried beans are made from pinto beans and work well in Mexican and Tex-Mex dishes. Pintos are also great when served in soups and salads and as a side dish. 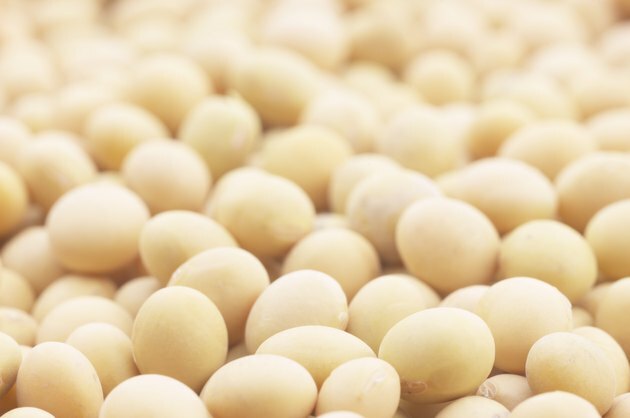 Garbanzo beans originated in the Middle East and are, according to the University of Arizona College of Agriculture and Life Sciences, the most widely consumed bean in the world. Also known as chickpeas, garbanzos contain 5.94 grams of protein and 5.3 grams of dietary fiber per 1/2-cup serving. 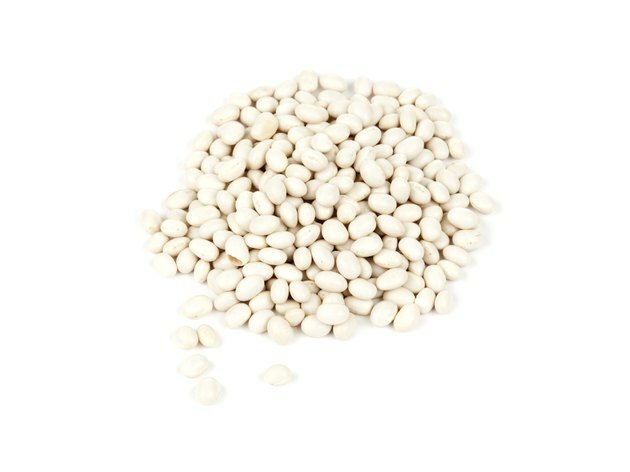 There are approximately 120 calories in a 1/2 cup of garbanzos, and these beans are best when used in salads, stews and soups. Hummus, a dip made from garbanzos, sesame paste, lemon juice and garlic, is one of the most popular ways to serve garbanzos. White beans became known as navy beans because they were a regular dietary staple for sailors at sea, according to the Michigan Bean Commission. 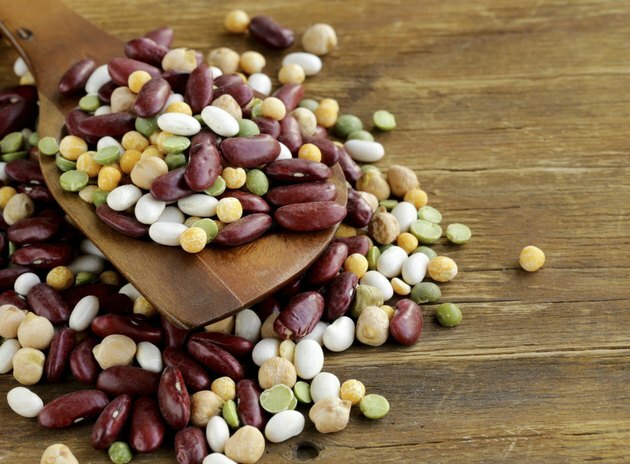 A 1/2-cup serving of navy beans contains about 130 calories, 8 grams of protein and 5 grams of fiber as well as folate, calcium and iron. The navy bean is most commonly used by commercial bean companies to make canned baked beans. You can also use navy beans in homemade pork and beans, soups, stews, chowders and casseroles.